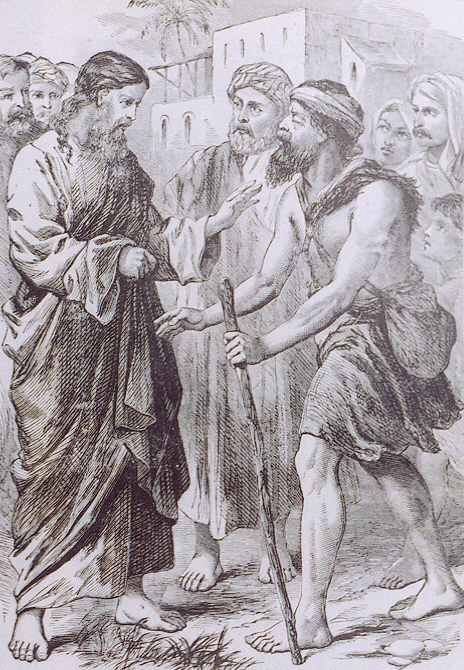 The blind man anticipates St. Paul's words: "When I am weak, then I am strong." (2 Cor 12:10) It is the acknowledgement of weakness, of wounds and of disabilities (of all varieties) that opens us to the power of God's grace. Without the acknowledgement, there is no openness. Without the openness, God's grace cannot enter. The recognition of our weakness allows God's strength - so much superior to our own - to enter. Which is the greater flaw - to sin or to deny one's sin? We all sin, but we do not all acknowledge our sins. Those who labor under the burden of sin's pain have a keen awareness of their weakness and wounds ... and their need for a savior. Only they will find Him. The unrepentant, those who deny their sinfulness - who invent all sorts of excuses and rationalizations - they have n need of a savior. And they will not find Him, or receive Him when He comes. They have lost not only their way but also their compass. We do not want to become like the Pharisees, blind to our own sins - blind, in effect, to our blindness. We want to know our sins so that we can find forgiveness for them, so that those open wounds become portals of grace. Thus a great Lenten practice is to ask God to convict us of our sins. No, it is not an easy or comfortable thing to do. But holiness never is. God knows our sins better than we do. Let us ask Him to reveal them to us, so that we can also find in them the opportunity to receive His grace and healing.